Cayenne pepper has numerous medicinal and culinary benefits. According to the University of Maryland Medical Center, Native Americans used cayenne pepper as food and medicine as long as 9,000 years ago. Cayenne contains a substance known as capsaicin that has pain-relieving properties. The substance is found in many over-the-counter arthritis creams and skin care products. Because of the herb's wide availability, you can easily make your own cayenne pepper remedies at home for treating a variety of ailments. An old-fashioned home remedy for treating toothaches includes cayenne pepper, which works as a counter-irritant to decrease deeper tooth pain and increase local blood flow. In his book “The Healing Benefits of Cayenne,” John Heinerman recommends adding a level tablespoon of ground cayenne pepper to a pint of strong whiskey and allowing the mixture to steep for two weeks. Shake thoroughly each day. After two weeks, strain the liquid into a glass bottle and store in a cool, dark place. To use, apply 4 to 6 drops of the mixture to a cotton ball and place directly onto the affected tooth. Repeat as needed. 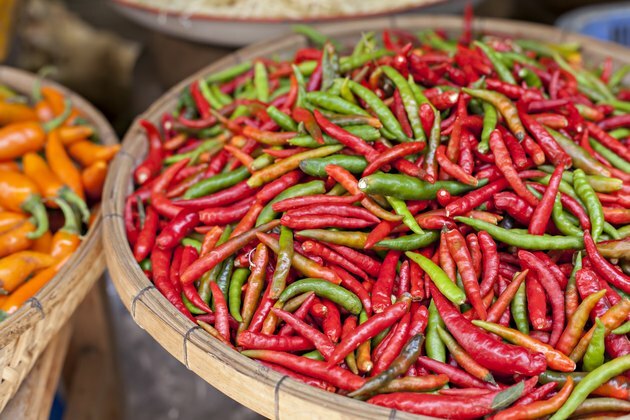 A warming stimulant, cayenne pepper offers benefits for the skin and joints. It increases circulation, speeds wound healing, reduces inflammation and desensitizes nerve endings to help relieve pain. It may help treat skin disorders such as psoriasis and eczema, and reduce joint pain caused by arthritis and rheumatism. In her book “The Top 100 Traditional Remedies,” Sarah Merson recommends making your own topical cayenne remedy that works similarly to commercial capsaicin cream. To make, place 3/4 cup chopped cayenne pepper in 2 1/4 cups olive oil in the top of a double boiler. Fill the bottom of the double boiler with water and place over low heat. Allow the cayenne mixture to simmer for 2 to 3 hours, and then remove from heat. Let the mixture cool to room temperature, and then strain through a fine-mesh strainer into a dark glass bottle. To use, massage into the skin to speed healing or into the joints to relieve pain up to three times daily as needed. Herbalists and natural healers have used cayenne pepper for centuries to help treat digestive problems such as upset stomach, ulcers and indigestion. Jude C. Todd, author of “Herbal Home Remedies,” suggests making cayenne tea to help treat digestive problems. Add 1/2 tsp. cayenne pepper powder to 1 cup boiling water, stir and allow the mixture to steep until cool enough to drink. Strain through a a piece of cheesecloth and drink the liquid immediately. Take up to 3 cups a day as needed with food. Do not take on an empty stomach, as this may cause slight irritation in some people. If you can't handle the heat, try taking cayenne in capsule form. Cayenne has a reputation for expediting the healing of wounds and reducing bleeding. In his book “Coconut Cures,” Bruce Fife recommends making a cayenne pepper poultice to heal wounds and stanch bleeding. Heat 1 part coconut oil until just warm, and then mix in 1 part ground cayenne pepper. Let the mixture cool, and then apply directly to the skin. Secure in place with a bandage and add more oil as needed to keep the poultice moist. Reapply every day until the wound heals. If necessary, use olive oil in place of coconut oil. Consult your physician before self-treating serious wounds with cayenne. What Are the Benefits of Olive Oil Massage?